Home / Automotive / Cars / Video: Lexus Sriracha Is ' It's Hot? So, this is not your typical Lexus Model. The founder of Sriracha Hot Sauce, David Tran, asked Lexus to customize a car according to his popular hot sauce. No joke, they went as far as putting Sriracha IN the steering wheel! West Coast Customs and Lexus went and, quite literally, made the worlds most flammin’ car. They started at the source – if you can excuse the pun – Huy Fong Foods, the factory where the hot sauce is made, and they simply took a look around for some inspiration. They quickly learned that millions of mild red jalapeño peppers mashed up send the Scoville Scale (that's the measurement of spicy) skywards. So much so, in fact, that everyone has to wear a mask in the factory. It was indisputable that the colour of the Lexus would be Sriracha red. To get the exact colour, they did indeed stick Sriracha sauce in the paint because, if you are going to make a custom car inspired by a condiment, it should look like its absolutely drenched in it. The paint also had specs of gold, reminiscent of chilli flakes, and then coated in clear gloss to resemble the bottle. Lexus didn’t only focus on what was inside the bottle but the bottle itself was incorporated in this design too. 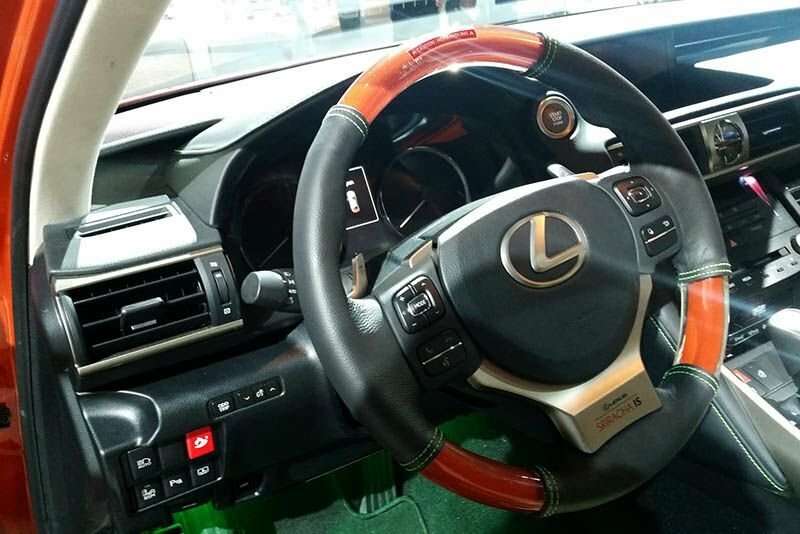 If you are familiar with the Sriracha bottle you will recall its bright green lid, so Lexus fused this bright green into the stitching of the leather seats, green lighting interior, green tipped exhaust pipes, green tipped chrome side view mirrors, a dispensable Sriracha key fob and personally (my least favourite), a green-tipped grille. Lexus was so kind as to include a “Sriracha” mode for David to especially make ‘Vroom Vroom’ noises. While this Lexus resembles a Sriracha bottle, it still undoubtedly has everything you would expect from a luxury car. Unfortunately for the spice-heads, this Lexus Sriracha IS is not for sale, however, you may full your boot with Sriracha Sauce in the 2017 Lexus IS... Kinda the same thing, right?